PanARMENIAN.Net - A new study from the University of Arizona has found that couples who argue with the same level of intensity have a lower risk of premature death, Earth.com reports. 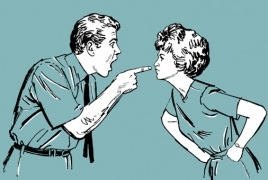 Arguments can be very stressful and some partners go to great lengths to avoid a confrontation. However, bottled up emotions can have some serious consequences. According to the researchers, if one partner holds back anger while the other partner aggressively discloses their feelings, it could almost double the risk of an early death. The groundbreaking investigation was focused on 192 couples over the course of 32 years. The study revealed that those couples with compatible fighting styles tended to live longer.